If you love babies and angels, you will love baby angel art. Baby angels have inspired many an artist, so you will find loads of artworks with this theme. Indeed, you will find paintings, posters, and statues featuring little angels. 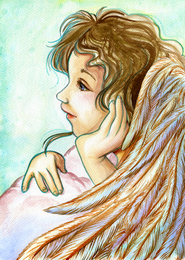 Below you will find a mini gallery showcasing a few pieces of baby angel art. It is so easy to depict angels as babies. After all, here on Earth babies seem to embody all that is pure and sweet. They remind us of heaven. The following pictures are brought to you in affiliation with Art.com.